While bouncing from economic crises to political crises and back again at an astounding rate, Brian Cowen has stumbled upon a brief opportunity to make a move that would reflect well both upon himself politically, and give a piece of potentially good economic news for the markets to ponder over for once. In a few weeks time, elections will be held to fill two vacant seats in the Seanad. The electorate for both of these seats are current TDs and Senators, and as the government has majorities in each chamber, government nominees are effectively guaranteed to win both seats. This gives Cowen the ability to bring pretty much whoever he likes into the Seanad in time for the new year. What’s more important, though, is that Cowen can, by article 28.7.2 of the constitution, appoint up to two members of the Seanad to the cabinet, which means that he can use these open Seanad positions as a platform to bring expertise into the cabinet that simply can’t be found amongst the ranks of the Dáil. While such a step would be almost completely unprecedented (the provision to appoint Senators to cabinet has only been used, to my knowledge, once in the history of the state), the situation we’re in is similarly unprecedented. We’re currently in the midst of the greatest fiscal, economic and employment crises to afflict any developed country since the great depression, and there are only three qualified economists sitting in the 166-seat Dáil, two of whom are on the opposition benches. The degree of experience within the business sector in the Oireachtas is similarly underwhelming, which means there is very little the government can do to increase its authority on matters of the economy without bringing in outside help. Bringing in fresh blood to take over as Finance Minister is not possible, as the position constitutionally has to be held by a TD. However, the second biggest economic portfolio, the Minister for Enterprise, Trade and Employment, is a perfect position to bring outside expertise into. The current Minister, Mary Coughlan, is widely considered to be way out of her depth in the portfolio, and her repeated gaffes are doing the government little help in the popularity stakes. As such, bringing in a suitably qualified person in her place would help show both the electorate and the markets just how seriously the government are taking the current economic crises. There certainly isn’t a shortage of candidates more qualified than Mary Coughlan for the position, but one that immediately springs to mind is Jim O’Hara. Jim O’Hara is currently Vice President of the Technology Manufacturing Group in Intel, and General Manager of Intel’s Irish operations, where he’s in charge of over 4000 employees. He’s very well respected in the business community, and he represents exactly the kind of high-tech, export-led industry that the government so desperately wants Ireland to become focussed on as we rebuild our economy. Furthermore, he showed during his involvement in the Lisbon Treaty campaign that he’s not only knowledgeable on political affairs, but also that he’s more than capable of presenting himself well in front of the political media. Bringing him into the cabinet could be done quickly and easily. As it would be best for O’Hara to be seen as apolitical in his appointment, running him as a Fianna Fail candidate for one of the two vacancies directly would not be advisable. However, Cowen could simply call on one of Fianna Fail’s 6 Taoiseach’s appointees in the Seanad to resign from their current seat and run for one of the vacant seats (which they’d be guaranteed to win). O’Hara could then be appointed by Cowen as an independent appointee of the Taoiseach into then-vacant slot. Cowen could perform a mini-reshuffle of the cabinet (most likely giving Coughlan back the Agriculture portfolio she previously held, and pushing Brendan Smith back into a Junior Ministry), and appoint O’Hara as Minister for Enterprise, Trade and Employment before the start of the new year. Brian Cowen needs to start taking radical steps towards both fixing the economy as well as improving the government’s tattered reputation if he wants to stay in office much longer. Most of the choices available to him would involve substantial opposition from vested interests across the country. He now, however, has the opportunity to make an unprecedented move that would be opposed by virtually no-one but Mary Coughlan. By appointing Jim O’Hara as Minister for Trade, Enterprise and Employment, Cowen could show just how seriously he’s taking the crisis, and that he’s willing to think outside the box in his efforts to do so. And, as an added bonus for Cowen, the appointment would also be a political jab against Enda Kenny. Kenny decided last month that the Seanad is useless and he’d scrap it if elected Taoiseach, an announcement that was considered rash even by many members of his own party. By using the Seanad as a means to bring extra experience into the cabinet, Cowen could prove to Kenny that it isn’t so useless an institution after all. With the Copenhagen climate change convention coming up next month, many governments such as ours are looking for ways to demonstrate their commitment to long-term cuts in carbon emissions. Unfortunately, very few of these are anything more than worthless platitudes, and Ireland’s plans certainly fit within this category. Last week, the Joint Oireachtas Committee on Climate Change produced a report making a number of recommendations in advance of the Copenhagen convention. Chief amongst these is a recommendation that legally binding emissions targets be put in place, and that the Taoiseach be held legally responsible for sticking to these targets. As well meaning as these recommendations are, they simply don’t address the reality of the situation. First off, there’s no constitutional mechanism for the Oireachtas to set such immutable targets. Any bill which the Oireachtas passes to restrict itself and the government in such a manner can simply be amended at a later point, making it an effectively worthless guarantee of future behavior, especially when the composition of the Dáil and cabinet may be radically different by the time the guarantee is meant to take effect. The question also arises of what exactly happens if these “legally binding” targets are exceeded? The state can hardly levy a fine upon itself. The further recommendation of making the Taoiseach legally responsible makes equally little sense. It’s simply unworkable to make a single individual, who may be in office for only a couple of years, legally responsible for the results of a decades-long program which involves the entire economy. Of course, this begs the question of exactly how a government can make long-term commitments to reduced emissions levels. With the possibility of a new government being elected in a few years with completely different priorities, it’s hard to take seriously any long term plans of this kind. Furthermore, the credibility of the targets, and not just the targets themselves, are vitally important if we want to ensure long term reductions in emissions. This is because the sort of decisions businesses take to reduce emissions often have effects long into the future, even if those decisions can only be made on information available now. For one reason or another, the housing market has been on my mind recently, and in particular the various guesstimates of how much further house prices have to drop, or if they’ve already bottomed out, as some buyers might like to believe. Hence, as I have a tendency to do in these sort of situations, I decided to throw a load of numbers into an Excel spreadsheet and make my own attempt at empirically forecasting what “stable” house prices might look like, and how far we have to go until we get there. 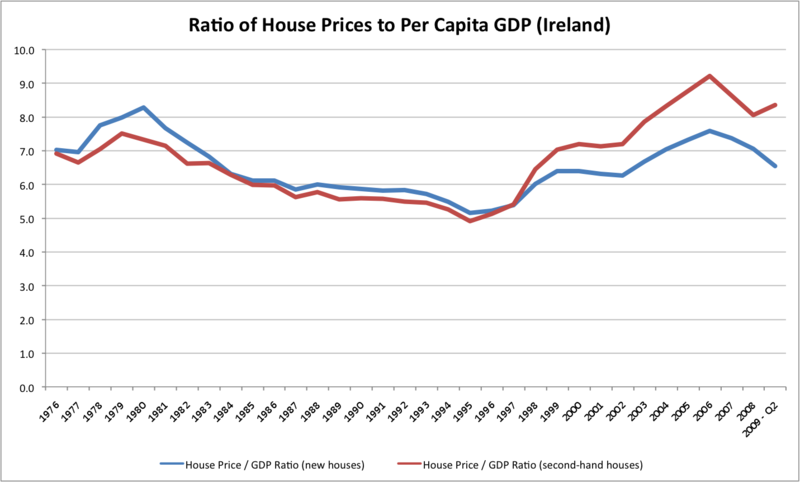 In doing this, I’ve focussed on the ratio of house prices to the country’s per capita GDP, and how this ratio has changed over the years. It would be reasonable to expect this ratio to be quite stable over time; the amount people are willing to pay for a property should be proportional to their earnings at the time. The Department of the Environment provides two separate series of house prices, one for new houses and one for second hand houses. Over the past decade the price of new houses has been quite a lot lower than second hand houses, as new builds have primarily been apartments and small houses which would bring down the average. For this reason I’m going to focus on the prices of second hand houses (red line above), although I’ve included new houses (blue line) in the graph for completeness. What’s immediately obvious from the graph is the house price bubble over the past decade, reaching a peak of over 9 times per capita GDP in 2006. There was also a similar bubble, although not nearly as pronounced, in the latter years of the 70s. In trying to gauge what a “stable” ratio might look like, it’s the inter-bubble years between these two that we should be looking at. As such, I would propose that a ratio of 6 or below be considered stable for the housing market. The ratio stayed below this level from 1985 to 1997, and, aside from a dip in the mid-90s, was pretty steady throughout. As can be clearly seen in the graph, if a ratio of 6 is stable, we’re still far from stable at the moment. In order to estimate how much further house prices have to drop to get to a ratio of 6 times per capita GDP, I’ve worked on the assumption that both nominal house prices and GDP will bottom out at the end of 2010. I’ve used the ESRI’s projections of GDP for this year and the next in my calculations. After doing the sums, it seems that nominal second hand house prices will have to fall by a further 27.2% below Q2 2009 levels if they’re to reach a stable ratio to GDP by the end of next year. Of course, I’m using a ratio of 6 as an upper bound for stability; if the ratio was to reach as low as 4.91 (which it got to in 1995), then we could be looking at a drop of 40.4% in nominal prices instead. This shouldn’t come as pleasant reading for anyone who has a vested interest in high property prices. Unfortunately, with the NAMA legislation now making its way through the Dáil, it won’t be long before we all have such a vested interest, which is becoming more worrying by the day. Ireland is in the middle of what can only be described as a complete economic meltdown, with a recession to the tune of 8% of GDP, unemployment reaching into double digits, and a catastrophic decay in the public finances. Attempts to deal with these problems have unfortunately been limited to tinkering around the edges with marginal changes in the tax rates and limited cuts in public expenditure. The recent mini-budget has continued with this approach, and there have been very few proposals that have gone much further than creative accountancy when it comes to the budget, and little more than platitudes regarding a reduction in the unemployment rate, let alone anything that seriously addresses the collapse in GDP. There is, however, a little known miracle cure that could do the trick for the Irish economy. It’s a relatively simple idea that could create 300,000 jobs, save the Government €2 billion, bring down the cost of living, dramatically increase Irish competitiveness and turn the corner towards economic growth. Sounds too good to be true? Perhaps it is, because nobody’s ever actually tried it.